Protect Yourself from Dirt, Dust and Pollution or Keep from Spreading Germs with a Multilayer N95 Respirator Mask. Whether you're sick, easily affected by allergies, or just want to avoid dust and pollen in the air, a face mask can help block out impurities so you can breathe a little easier. That's why we created these advanced, multilayer N95 Respirator Masks that offer better protection, superior comfort, and long-lasting support to keep you healthier and safer no matter what life brings your way. Whether you wear it when you're sick or while traveling to locations known for bacteria or viruses, these N95 respirator masks help block colds, viruses, pollens and potentially dangerous bacteria so you can breathe easier every day. These breathing masks not only help block bacteria, dirt, dust and particles in the air, they can be hand washed and air dried to be used over and over again! This helps reduce your carbon footprint, save money, and even protect your health for the long-term. Each respirator mask is fitted with adjustable, over-the-ear straps to ensure better all-day comfort that won't pinch, bind or chaff the skin. The multi-layer design with activated carbon and soft, breathable cotton provides better environmental protection without limiting breathing or impacting comfort. These anti-pollution masks can be worn by men, women and children alike, providing the support you need. 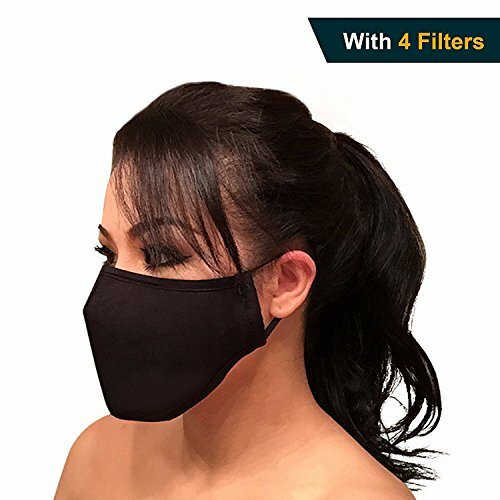 INCLUDES 4 CARBON FILTERS - Each mask respirator also comes complete with 4pcs PM2.5 carbon replacement filters for longer-lasting use at home or when traveling. MULTI-LAYER PROTECTION - Each face mask respirator is crafted with five layers of support that contains activated carbon, melt-blown cotton, and non-woven fabric. HOME, OFFICE, TRAVEL USE - These reusable respirator masks can be washed by hand and worn before or after you get sick, while motorcycle riding or just being outdoors. PROTECTS KIDS & ADULTS - Offering a one-size-fits-most design with adjustable face straps, our vapor respirator mask helps protect men, women and children of all ages. MAINTAIN PROPER HEALTH - This N95 particulate respirator mask helps block bacteria, pollen, dust, pollution and cold-causing germs to keep you safe and healthy. If you have any questions about this product by Seffer, contact us by completing and submitting the form below. If you are looking for a specif part number, please include it with your message.